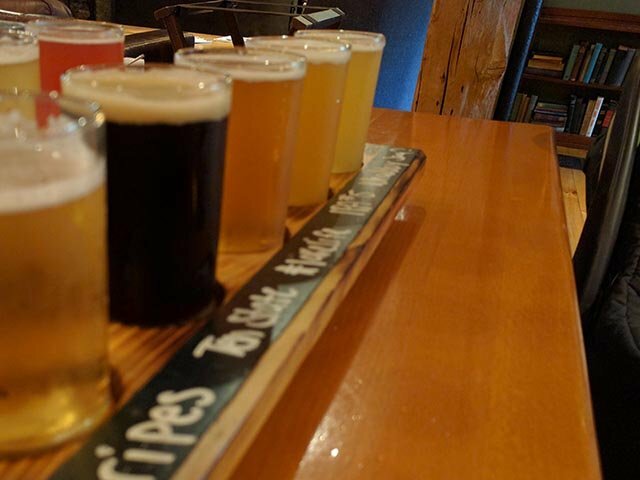 Hobbs Tavern & Brewing Company: A buffet of great craft beer. 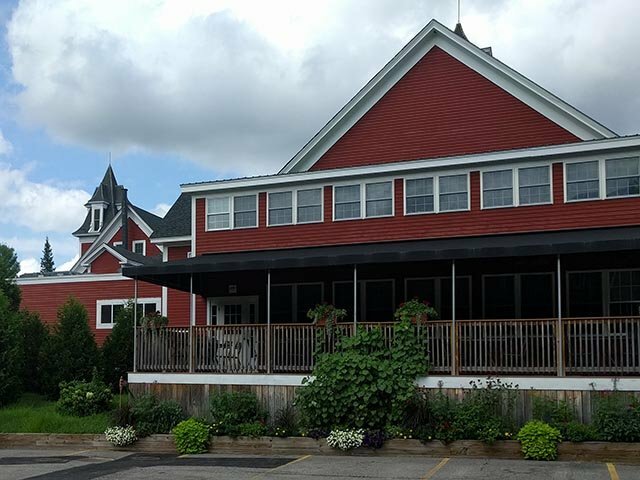 This Lakes Region brewery is full blown restaurant, serving delicious food, tasty craft beers, and two scoops of rustic charm. Here's a hint, grab a pint and sit on the couch by the fireplace for maximum Hobbs Tavern effect. Where is Hobbs Tavern located? At the foot of Mt. Whittier, just southeast of the White Moutain National Forest in West Ossipee, NH. It’s around the corner from the Yankee Smokehouse, an authentic southern smokehouse BBQ restuarant. It’s 5 miles away from the Sap House Meadery. 20 miles from North Conway and the Lakes Region (Wolfeboro and Meredith). 40 miles from Sebago Lake. And about 50-60 miles away from ski resorts like Loon Mountain and Sunday River, and Portland, ME. Maybe someday when we return. In 1885, the Hobbs family built the house, barn, and farm on the land that the current Hobbs Tavern sits on. The new owners decided to use the Hobbs name to pay homage to their past settlement. Randy Booth is the head brewer and Anthony Swanick is the assistant. 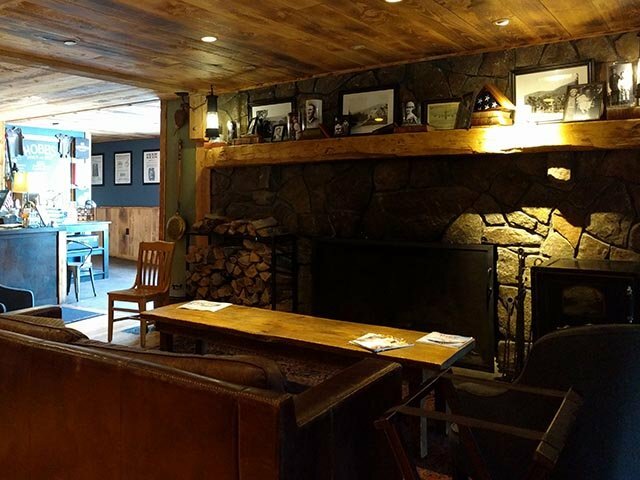 Spacious, with a fireplace and couch straight off the host stand, opening up to a more formal dining room that encapsulates the in-the-round bar. 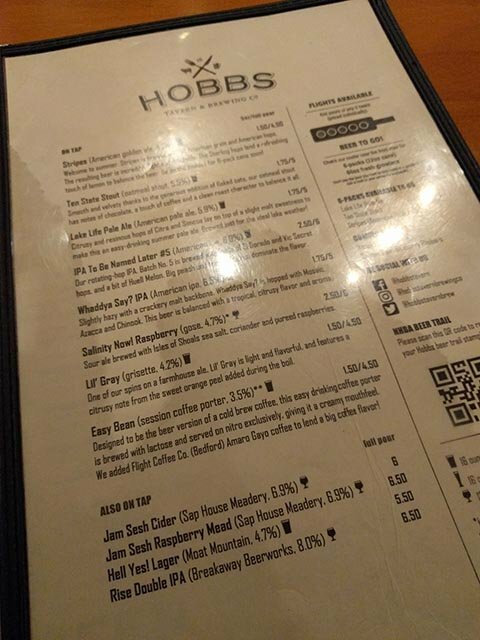 What types of beer does Hobbs Brewing brew? American pale ales and IPAs. Grisettes, gose, and oatmeal stouts. Golden ales, porters, and more. Got two flights, one of everything on the list below. The Whaddya Say? IPA was pretty tasty, same with the Lil’ Gray. They even import from the Sap House Meadery, Moun Mountain Brewing, and Breakaway Beerworks. 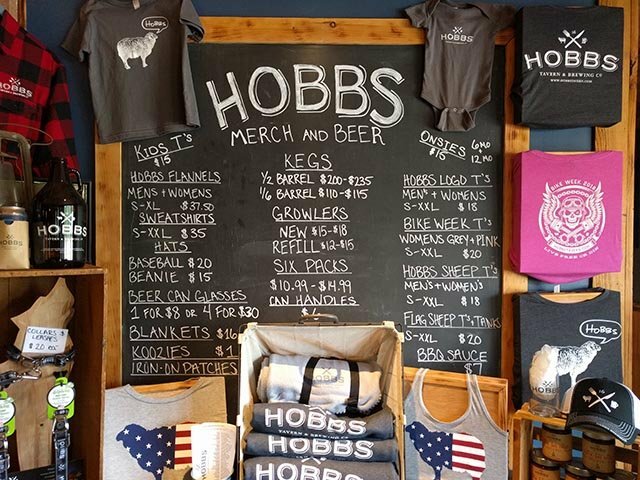 Hobbs Brewing offers it all. Flights, growlers, even kegs (1⁄6 and 1⁄2). Hobbs Tavern and Brewing Company sells kegs! Yes. Full-service restaurant with alcohol and wine. T-shirts (even one for Bike Week), flannels, hats, sweatshirts, tank tops, pint glasses, koozies, blankets, BBQ sauce, and onesies for your future craft beer drinker. Does Hobbs Tavern serve food? Without a doubt. 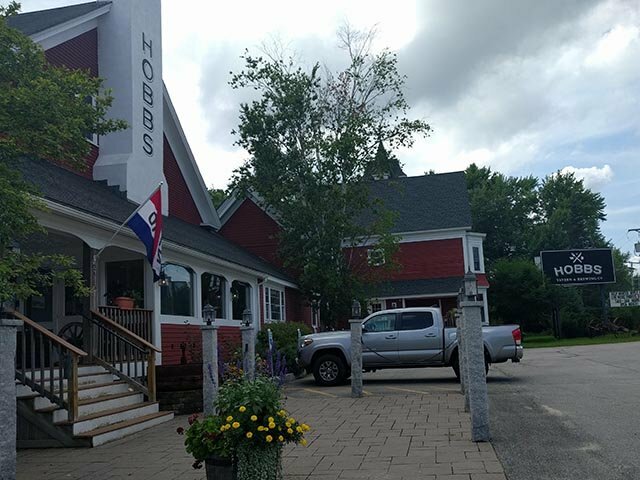 Hobbs Tavern is a full blown restaurant with a lunch and dinner menu. You can dine outside if the weather is nice. 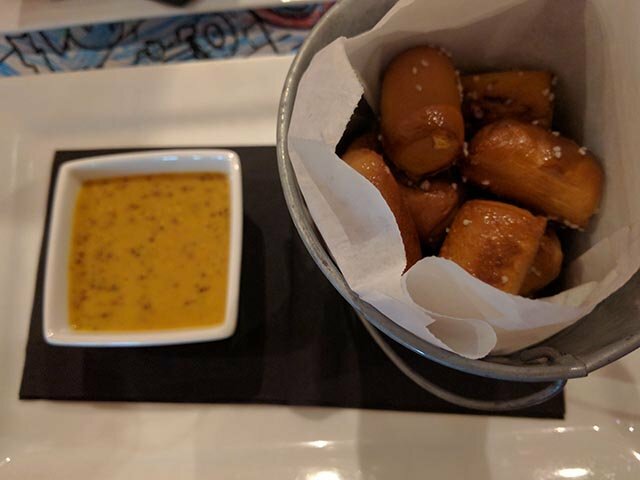 The IPA mustard on the pretzel bites was a treat. Tasty pretzels give Kettlehead's pretzels a run for their money! Live Music Friday nights. Trivia Night on Tuesdays (they even give you 5 pts for making a reservation). Occassional Paint Nights. They even host weddings, which are a special kind of entertainment. Sure can. Case N Keg (Laconia and Meredith), Pine Cone Country Store (Melvin Village), Greg & Jane’s (Epping), Beveridge (Wolfeboro), Gary’s Beverages (Portsmouth), The Beer Store (Nashua), and more, just to name a few. Kid friendly. They offered up small pails of crayons to draw on the back of their kid’s menus. They also had a baby changing station in the women’s bathroom. 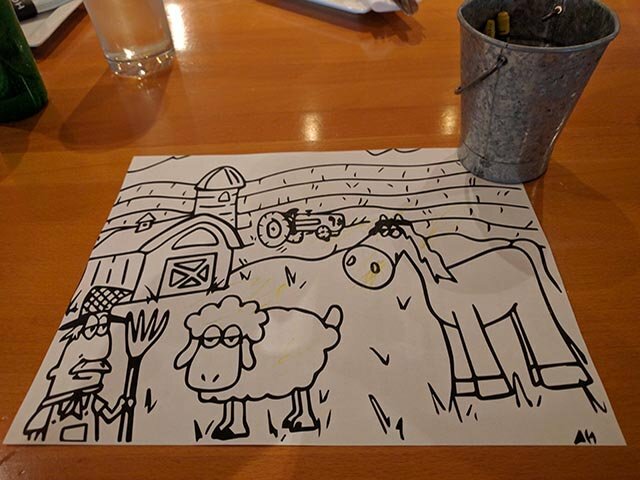 The back of the kids menu is ready to be drawn on.